Queer collegiate athletes can risk their professional careers by coming out. Queer college athletes have a higher risk of risking their professional sports careers by coming out due to the lack of support from the professional sports community. Coming out is an ongoing process, and for the queer athlete revealing one’s true identity does not stop in the locker room. “Homophobia is a salient theme within both collegiate and non-collegiate male athletic subcultures,” wrote researchers Kenneth B. Muir and Trina Seitz in their participant-observational study on machismo, misogyny, and homophobia within collegiate rugby. Machismo, or exaggerated heterosexual, male masculinity and the assertion of physical strength and dominance can be found within the athletic community. Muir and Seitz collected data over a four-year period examining deviant behaviors of active and non-active male collegiate rugby players in the southeast region of the United States. They observed, recorded, and assessed strong reoccurring instances of homophobic language and/or behavior, misogynistic ideologies, and heterosexual assertion of masculinity. It is no surprise then that male-dominated sports often disregard and exclude underrepresented members of the lesbian, gay, bisexual, transgender or questioning (LGBTQ) community. 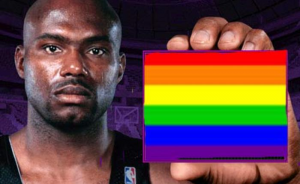 Although professional sports have made advancements in accepting gay athletes in the NFL with Michael Sam, and in the NBA with Jason Collins, there is still an unspoken preference for all athletes that are coming from collegiate sports to be straight. Sam with his excellent collegiate career in football as a defensive linemen has shown that backlash would not only come from the media, but from some of the team members he has played with on the Dallas Cowboys, as well as the St. Louis Rams. Unfortunately, Sam wasn’t able to make either of the teams this past NFL season because of results in training; this shows how no matter your skills you face discrimination from the media as well as players on the team. Collegiate athletes also could face this same fear in trying to come out of the closet. Lesbian – and those perceived to be lesbian – athletes are exposed to a different kind of discrimination. In 2006, former Penn State Lady Lion player Jennifer Harris filed a federal lawsuit against former head coach Rene Portland for discrimination based on her race and perceived sexual orientation. Though no evidence was found to substantiate Harris’ claim of racial discrimination, “enough evidence existed to substantiate a claim that Portland discriminated against Harris by creating a ‘hostile, intimidating, and offensive environment’ because of Harris’ sexual orientation,” according to Penn State. Media, peers, professional coaches and players all have an influence in the decision for collegiate athletes. Although society is accepting of most queer communities, as well as the people who populate them, the fear of rejection from a sport you have worked so hard to become professional or have the proficiency at, is discouraging for the queer athletes. Suppressing one’s identity for the sake of acceptance is a huge oxymoron. Gay collegiate athletes not only have the fear of not being able to further their careers in whichever sport they wish to pursue, but also have the fear of coming out of the closet and changing their personal and social lives completely. In the 2012 Campus Pride LGBTQ National College Athlete Report, 39 percent of LGBTQ athletes have felt harassed because of their sexual identity. Family life for some of these players, whether male or female, have been completely engulfed by the sports they play. When that family dynamic is changed with the confession of their sexuality, all relationships with their families change, either for the better or, unfortunately, for the worst. Although family dynamics are always something that is very important to most collegiate players, their social lives are also important, if not more. The people that make up the social lives these players lead are typically some of the first to know, and, unfortunately, sometimes coming out does not always work in their favor. Collegiate and professional sports should be an inclusive, non-discriminatory playing field where athletes are judged solely on their skills and character, not their gender or sexual identity. Queer athletes should have the same rights as their non-LGBTQ counterparts to be open about their identity and preferences. The queer athlete should not have to stay in the closet for fear of being harassed, demeaned, or even physically harmed.